A special event was recently held to mark the retirement of the Honourable Richard Edmonds. Members of the legal and academic profession attended a reception at the Allens office in Sydney on Monday 2 May to pay tribute to Justice Edmonds, who retired from the Federal Court of Australia in February 2016. 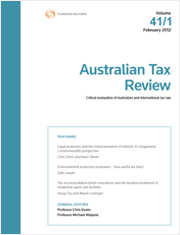 The latest issue of the Australian Tax Review (Volume 45 No 2, 2016), is a Special Issue dedicated to Justice Edmonds, and acknowledges the contribution he has made to Australian tax jurisprudence over a long and distinguished career. Justice Edmonds is a leading figure who has been at the forefront of major tax developments, and has delivered judgments in some of the most significant tax cases in Australia, some of which are discussed in the Special Issue. We at Thomson Reuters and the journals team would like to thank Professor Ann O’Connell for coordinating the preparation of the Special Issue, and Allens for holding the event. Thomson Reuters would like to thank Justice Edmonds on his invaluable contribution to Australian tax jurisprudence and wish him all the best in all his future endeavours. Thomson Reuters’ journals articles are available on request by completing the Individual Article Sale order form and emailing it to tlranz.journal.orders@thomsonreuters.com, or click here for more information on how to subscribe to or purchase our range of journals content.